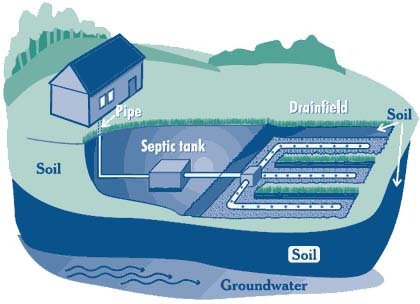 A septic system disposes of wastewater underground. A system has two parts - a septic tank and a disposal field. A septic tank is an underground box constructed of concrete or sometimes a round plastic tank. The septic tank removes most solid wastes from the water. Heavier solids settle to the bottom of the tank where the bacteria break them down into sludge. Lighter wastes (some solids, grease, oil, and some paper) form a crust or a "scum" layer on top of the water. Cleaner water between the two layers flows into the disposal field. Most solids fall out of the wastewater and remain in the tank. Bacteria breaks them down into sludge but never eliminates them completely; periodic cleaning is needed. There are different types of disposal fields. In each system waste water flows through pipes into layers of stone and course soil. The stone holds the water and allows it to filter slowly throughout the soil.